The car resulted not from Ford’s Styling studios, but actually from Ford’s prescient tie-in with the popular custom car wizards of the days, guys like George Barris, Gene Winfield , Darryl Starbird and Dean Jeffries. They might have been known coachbuilders around the world like Pininfarina or Ghia off in Italy, guys who affix little coachbuilder’s badges to some of the cars they design but damn it, they were our coachbuilders. Ford started the traveling road show called The Custom Car Caravan in 1962. Originally the plan was to have the cars built at Ford styling but as venues increased to show them they started accepting cars commissioned by private owners to be built at custom shops. One of the private outside-Ford designers was an Indiana lad named Vincent Gardner. He had won the Fisher Body Craftsman’s Guild award while still in high school. That was an award where you built a model car and were judged on that, receiving, I believe a college scholarship. He began in the auto industry before the war with the Auburn Automobile Company, when they were developing the Cord cars, very advanced for their time, and worked on Cord 810. Then he went to Studebaker where he worked under the famous French-born Raymond Loewy, who did a lot of Studies including the Avanti. But Gardner yearned to hang out his own shingle and as early as 1951 was doing his own designs. Roughly a dozen years later he began working with Andy Hotton’s Dearborn Steel Tubing, a shop in Detroit that built prototypes for Ford, everything from race cars to limousines. 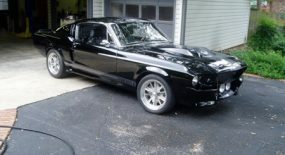 In fact in ’64 they were busy making a lot of ’64 Mustangs into AFX drag racing cars. When the Mustang came out, he saw this exciting new car as a good vehicle to showcase his talent. He glommed onto a Mustang in 1963. It was one of ten pre-production 1965 chassis. 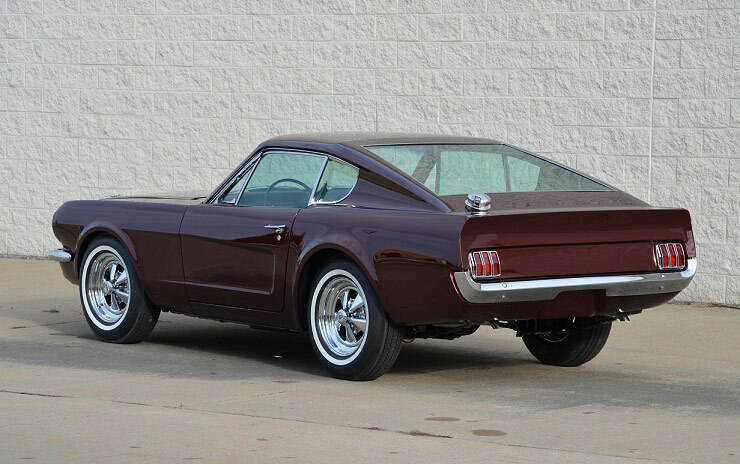 (chassis 100009) He shortened the wheelbase, and did his own fastback, similar to the one Ford offered in ’65 ½ but yet with its own character due to its wheelbase, shorter by 16 inches. Some think he chopped out too much but he wanted a dramatic car and only by making it a two seater could he do that. Interestingly, Gary Witzenberg, a renowned historian, says that a GM designer Gail Halderman, told him that Ford had tried to make a two seater prototype but when they chopped the Mustang shorter, they found there wasn’t enough room for the spare tire, fuel tank, and luggage. There are a half dozen pictures in various Mustang books showing two seater Mustang hardtops so Gardner was merely echoing what was already happening inside Ford, though the public didn’t see those two seaters. Now comes the weird part. Since Ford regularly destroyed concept cars (they had hundreds, jammed into warehouses, I’ve found some of them myself) he was afraid they would destroy his car when its show biz career was over. The urban legend is that he took it out of the cars stored from the Caravan and walled it up inside an Inkster, Michigan warehouse. Then he didn’t’t pay the rent. Ironically an executive at the Insurance company that paid the claim on the lost car bought it when it was found six months later, and eventually sold it. This according to a story on the website InMyGarage.com. Most people forgot it existed. But Bill Snyder didn’t. In 2011 he told some of the car’s history on a website called the Shelby Forum . One interesting comment he made there was that the chassis was shortened by Ford Engineering. 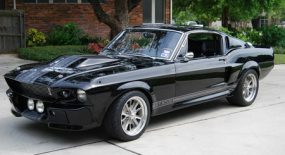 This account is somewhat in contrast with the story that did not know of the car being built until after it was being built, though I am sure engineers working on the Ford drag racing Mustangs saw the car being built at DST as they used Andy Hotton to build the drag Mustangs. He discovered mention of the car in Motor Trend in 1965, when they were talking about a limited amount of the cars being built and those with fiberglass bodies. At the time he was driving a 1954 Corvette and thinking of getting a new car, and this one would have a fiberglass body. He also says it was stolen from the our base in Inkster, MI, which when you use the word “stolen” indicates the presence of an insurance payment being made, because otherwise the implication is that Gardner reported it stolen. 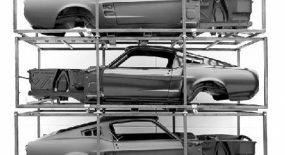 Ponysite.de in Germany, which has a lot of histories of rare Mustangs, says Ford only rented the car from Gardner. Snyder told the website: “Long story short the car was hidden behind a wall in a nearby warehouse with rent paid for over twelve months. During that time the insurance company paid for the lost car believing that it had been broken up for parts. Eventually the wall was knocked down and the insurance company took possession. 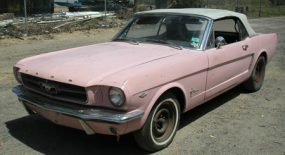 Then it was stored outside in Connecticut till 1969 when it was advertised in Hemmings. I bought it over the phone and it sits in my garage now awaiting restoration. It has few miles but the several years out side in the weather ravaged the candy apple lacquer paint as well as the SS wheels and chrome.” Snyder got the car restored, by Michael Capozzi of Capaldi Enterprises and displayed it to much acclaim. Lesson learned? Bill Snyder lusted after this car for a long time, and in fact, you could say that for a long time he was the only one who still remembered it who still had the torch burning for it. 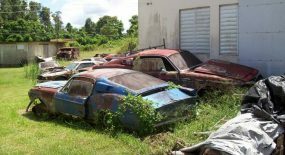 When it came up for sale in Hemmings, he was ready willing and able to buy it, though he couldn’t summon up the moola to restore it until some years later. What’s the car worth today? Well, it spans that once inseparable gulf between factory concept car (called “dream cars” in the Fifties) and custom car. In this case it was Ford showing the car so it makes it a “factory approved” custom, welcoming it into the fold so to speak. If it can be documented that Ford engineers were involved in the chassis shortening or Ford stylists approved Gardner’s drawings, then it becomes even more of a factory prototype…. Even if you read all the stories that have been printed since its restoration and display, a few questions remain unanswered: Who did the insurance company write the check out to? Gardner or Ford? Did Ford shorten the chassis for DST or did DST do it according to their own ideas? Did it have a fiberglass body, if not all fiberglass, which parts? And was the design for Ford’s 2-plus-2 fastback already “hardened” and scheduled for production before this car was done? If it was, we can’t quite say Gardner’s creation spawned the production model. Finally what did the insurance company pay out for it and how much did the insurance executive sell it for? If anyone knows the answers, we’d love to hear them.